Rest In Peace Chris Cornell — I’m thankful your music will live on even after you chose not to. 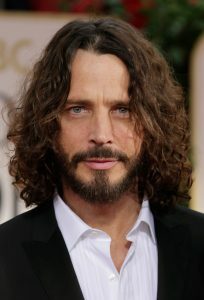 My first (high-school) puppy love was often told that he looked like Chris Cornell, and back then I didn’t know who he was, because I’ve always been horrible with names (can’t remember names of streets, people, bands, song titles, etc, but I never forget a face or a phone number oddly enough). Then I saw his photo on a CD and was amazed at the resemblance. So his passing is kinda weird as well as sad for me, because of course I knew his voice. He will be missed.